Windows 10 is out and I know already most of you are using it or going to upgrade to Windows 10 very soon. I already published a guide about how to activate Windows 10 without product key for people who have lost their keys and unable to upgrade. Windows 10 has brought a bunch of very useful features with it, but some of the features may also be threat to privacy or security. 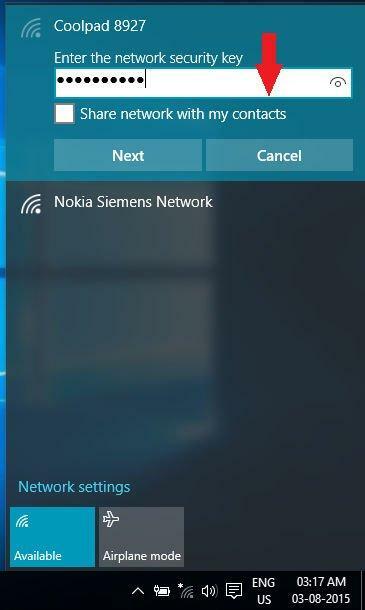 Such a feature is Wi-Fi Sense which was actually introduced in Windows 8.1 and now it is on Windows 10. This feature lets you share your Wi-Fi with friends, by sharing Wi-Fi password. Okay, sharing is caring, but sometimes it may be dangerous for your privacy or security. So, in this article I will tell you how to stop Windows 10 from sharing your Wi-Fi password. Now, the concept is simple. You visit any friends home and you connect to your his Wi-Fi and use it. Now, Wi-Fi Sense will automatically connect to the network in future and will also share the Wi-Fi with your friends. 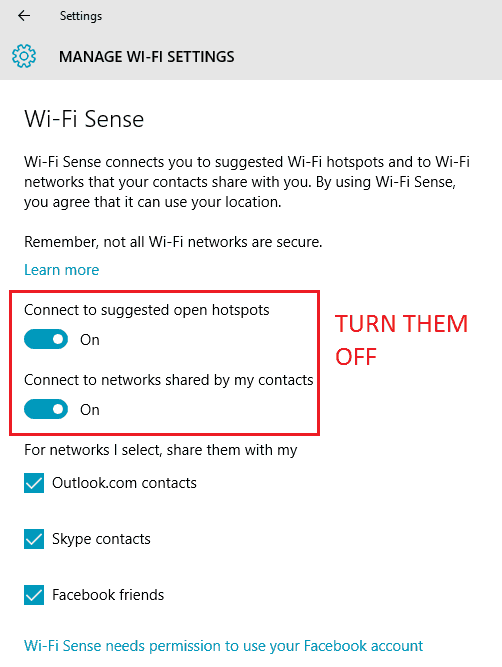 So, even if your friend doesn’t want to share his Wi-Fi, his Wi-Fi may be shared via Skype, Outlook and Facebook. Wi-Fi Sense has three key parameters. It can connect to any open Wi-Fi network on your behalf. It will share the password protected networks with your friends so that when they visit some place where you used a protected Wi-Fi they don’t need to remember any details, the password will be shared with them and they can connect to the network. So, the same thing applies to you. Wi-Fi Sense can share your home Wi-Fi password with your friends. And this may lead to sharing your password to people who you may not even know, and this can happen very easily via Facebook, Outlook or Skype. Follow the guide carefully to know how to stop Windows 1o from sharing your Wi-Fi password. 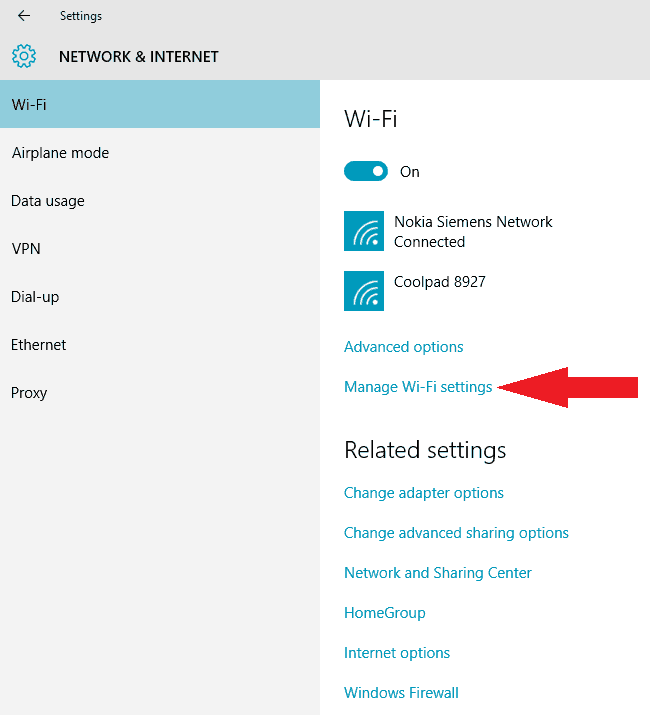 How to enable or disable the Wi-Fi Sense? The first thing you can do is to disable sharing for each network you connect individually. To do that, when you connect uncheck the ‘share network with my contacts’. Remember, you need to do this each time when you connect to any network. But what if you like to disable it forever? To do that, you need to go to Settings and select Network and Internet. Head over to WiFi and find Manage WiFi Settings. From there you can enable or disable the Wi-Fi Sense. You can choose to select over which services you want to share your Wi-Fi. 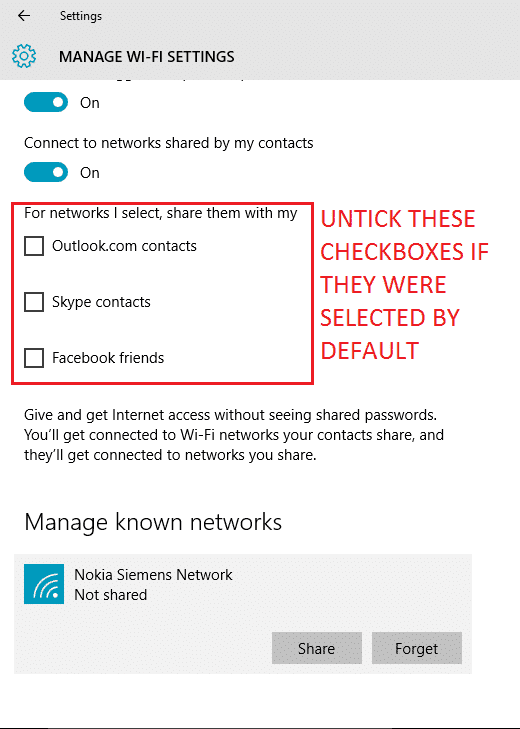 To stop sharing via certain network uncheck that option, and to disable for all uncheck all. Here you can see that sharing via Facebook needs your permission, but for platforms like Outlook or Skype there is no need of authorization as they are owned by Microsoft. So, follow the steps carefully and choose wisely. 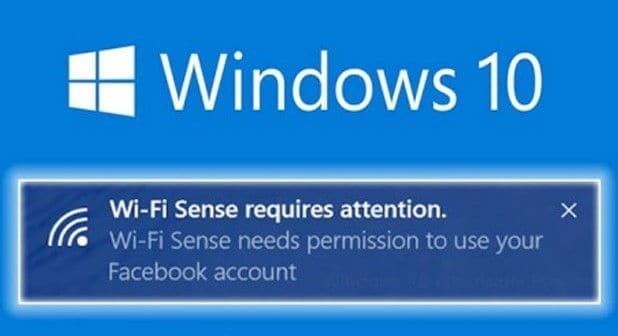 Remember, the Wi-Fi Sense can not discriminate between who your close friends are, who lives near your house or anything so it shares your password with all your friends via any of the networks- Outlook, Skype or Facebook. Therefore, use this feature carefully to protect your privacy. I will be back with more Windows 10 tips and tricks, troubleshooting guides and much more, Keep visiting us.